Genome-wide association studies have shown that variants near the melanocortin 4 receptor gene (MC4R) (rs17782313 and rs12970134) are associated with risk of obesity in Europeans. As obesity is associated with an increased risk of type 2 diabetes, many studies have investigated the association between polymorphisms near the MC4R gene and type 2 diabetes risk across different ethnic populations, with inconsistent results. In this study, we performed a meta-analysis to clarify the association of variants near MC4R with type 2 diabetes risk. Published literature from PubMed and Embase was retrieved. 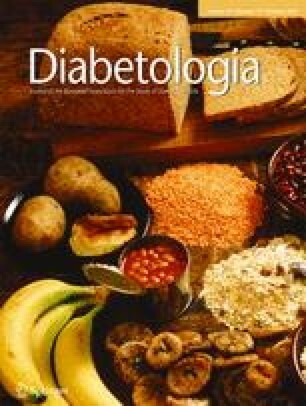 All studies that evaluated the association of at least one of the two MC4R polymorphism(s) with type 2 diabetes were included in the study. Pooled ORs with 95% CIs were calculated using the fixed-effects model. A total of 19 studies (comprising 34,195 cases and 89,178 controls) of the rs17782313 polymorphism (or its proxy rs12970134) were included in the meta-analysis. The results indicated that the rs17782313 polymorphism was significantly associated with type 2 diabetes risk among the overall study population (OR 1.10, 95% CI 1.07, 1.13, p = 2.83 × 10−12 [Z test], I 2 = 9.1%, p = 0.345 [heterogeneity]). The association remained significant even after adjustment for body mass index (BMI) (OR 1.06, 95% CI 1.03, 1.09, p = 2.14 × 10–5 [Z test], I 2 = 4.9%, p = 0.397 [heterogeneity]). Further sensitivity analysis confirmed the statistically significant association of rs17782313 polymorphism with type 2 diabetes, and no publication bias was detected. The present meta-analysis confirmed the significant association of the rs17782313 polymorphism near the MC4R gene with type 2 diabetes risk, which was independent of BMI. A full list of members of the AGEN-T2D Consortium is provided in the electronic supplementary material (ESM). B. Xi, F. Takeuchi and G. R. Chandak contributed equally to this work. The online version of this article (doi: 10.1007/s00125-012-2655-5) contains peer-reviewed but unedited supplementary material, which is available to authorised users. Type 2 diabetes is one of the main health issues worldwide. It is a complex disease that involves genetic and environmental factors and their interactions. Many studies have indicated that obesity increases the risk of type 2 diabetes . However, the mechanism underlying the association between obesity and type 2 diabetes remains unclear and it is possible that these features share a common genetic background. Recent genome-wide association studies (GWASs) have identified many single nucleotide polymorphisms (SNPs) that are significantly associated with obesity [2, 3, 4, 5, 6]. Of these, the fat mass and obesity-associated gene (FTO) shows the largest effect. In 2007, Frayling et al  found that the significant association between rs9939609 polymorphism in FTO and type 2 diabetes was abolished after adjustment for BMI (crude OR 1.15, 95% CI 1.09, 1.23; after adjustment for BMI, OR 1.03, 95% CI 0.96, 1.10), suggesting that the effect of the FTO variant on type 2 diabetes risk in Europeans is mediated through BMI. However, a recent large meta-analysis comprising 96,551 individuals demonstrated that the FTO polymorphism was significantly associated with type 2 diabetes independent of BMI among East and South Asians (crude OR 1.15, 95% CI 1.09, 1.21; after adjustment for BMI, OR 1.10, 95% CI 1.05, 1.16) . In 2008, variants near the melanocortin 4 receptor gene (MC4R) (rs17782313 and rs12970134) were reported as the second association signal for BMI/obesity by two GWASs [3, 4]. The association was subsequently confirmed by other GWASs [5, 6]. As obesity is associated with an increased risk of type 2 diabetes, many studies have investigated the association between polymorphism near the MC4R gene and type 2 diabetes risk across different ethnic populations; however, the results have been inconsistent [3, 6, 8, 9, 10, 11, 12, 13, 14, 15, 16]. In this study, a systematic meta-analysis was performed to clarify the association between polymorphism(s) near the MC4R gene and the risk of type 2 diabetes. We searched literature databases, including PubMed and Embase. The search strategy was to identify all possible studies involving the following key words: (melanocortin 4 receptor gene or MC4R) and (polymorphism or variant or variation) and (type 2 diabetes or T2D). The publication language was restricted to English. The reference lists of retrieved articles were hand-searched. If more than one article was published using the same case series, only the study with the largest sample size was included. The literature search was updated on 25 March 2012. We also investigated the association of the MC4R rs17782313 variant with type 2 diabetes in two large GWAS consortia belonging to two different ethnicities: the Diabetes Genetics Replication And Meta-analysis (DIAGRAM) consortium (11,275 cases and 11,275 controls of European ancestry) ; and the Asian Genetic Epidemiology Network–Type 2 Diabetes (AGEN-T2D) Consortium (6,952 cases and 11,865 controls of East Asian ancestry) . The studies were included in the meta-analysis only if they met all the following inclusion criteria: (1) evaluation of the association of MC4R polymorphism(s) (rs17782313 and/or rs12970134) with type 2 diabetes; (2) use of a case–control or cohort design; and (3) provision of an OR with 95% CI under an additive model or sufficient data for calculation of this estimate. The following information was extracted from each study: (1) name of the first author; (2) year of publication; (3) country of origin; (4) ethnicity of the studied population; (5) study design; (6) number of cases and controls; (7) frequency of men and the mean ages; (8) mean BMI; and (9) studied SNPs. Two authors independently reviewed the articles for compliance with the inclusion/exclusion criteria, resolved disagreements and reached a consistent decision. All participants of the included studies provided informed consent and the studies were approved by the ethics committees of the participating institutions. The association of MC4R polymorphism with type 2 diabetes was estimated by calculating the pooled OR and 95% CI. The significance of the OR was determined by the Z test (p < 0.05 was considered statistically significant). Cochrane’s Q test was performed to test the between-study heterogeneity. A random-effects (DerSimonian–Laird) or fixed-effects (Mantel–Haenszel) model was used to calculate the pooled OR in the presence (p ≤ 0.10) or absence (p > 0.10) of heterogeneity, respectively. Publication bias was assessed by Begg’s test and Egger’s test (p < 0.05 was considered statistically significant). To evaluate the stability of the results, we performed a sensitivity analysis by removing one study at a time. Data were analysed using STATA version 11.0 (StataCorp LP, College Station, TX, USA). A flow chart describing the process of inclusion/exclusion of study is presented in Fig. 1. The literature search identified a total of 73 potentially relevant articles. Of these, 50 were excluded after reading the title or abstract because of obvious irrelevance, e.g. experimental articles and functional research. In addition, one article was excluded as it was a review and nine articles were excluded because they investigated the association between the MC4R polymorphism and obesity, obesity-related traits, stroke or polycystic ovary syndrome. Therefore, 13 articles met the primary inclusion criteria, of which one article was excluded because it was a duplicated publication  and another article was excluded because it did not provide sufficient data for calculation of an OR with 95% CI . In addition, the nine studies included in the paper by Loos et al  were considered as separate studies in the following data analysis. The variant rs17782313 is known to be in high linkage disequilibrium (LD) with rs12970134 (D′ = 0.95, r 2 = 0.82 in CEU (Utah residents with Northern and Western European ancestry from the CEPH collection); D′ = 0.902, r 2 = 0.813 in CHB (Han Chinese in Beijing, China); D′ = 0.911, r 2 = 0.662 in JPT (Japanese in Tokyo, Japan)). Because of the high LD, we could not clarify which of the two SNPs is primarily associated with type 2 diabetes. In addition, if any study analysed both polymorphisms, only the rs17782313 polymorphism was selected. A total of 19 studies (comprising 34,195 cases and 89,178 controls) for rs17782313 (or its proxy rs12970134) polymorphism were included in the meta-analysis [3, 6, 8, 9, 10, 11, 12, 13, 14, 15, 16]. Of these, 14 studies involved Europeans, four were of East Asians, and one involved South Asians. The genotype frequency in controls was in Hardy–Weinberg equilibrium for all included studies (p > 0.05). All studies (except for the study by Huang et al ) provided the crude and adjusted ORs with 95% CIs (adjusted for BMI), and the majority provided ORs with 95% CIs under an additive genetic model, hence we calculated the summary estimate under this model only . The characteristics of the included studies are listed in Table 1. The results showed a significant association of the rs17782313 polymorphism near the MC4R gene with the risk of type 2 diabetes (OR 1.10, 95% CI 1.07, 1.13, p = 2.83 × 10–12 [Z test], I 2 = 9.1%, p = 0.345 [heterogeneity], Fig. 2a), which retained significance even after adjustment for BMI (OR 1.06, 95% CI 1.03, 1.09, p = 2.14 × 10–5 [Z test], I 2 = 4.9%, p = 0.397 [heterogeneity], Fig. 2b). The results were similar in subgroups of Europeans and East Asians (electronic supplementary material [ESM] Fig. 1a and ESM Fig. 1b). Sensitivity analysis was performed by excluding one study at a time. The results confirmed the significant association between the rs17782313 polymorphism near the MC4R gene and the risk of type 2 diabetes, with ORs and 95% CIs ranging from 1.09 (1.06, 1.12) to 1.11 (1.08, 1.14), and from 1.05 (1.02, 1.09) to 1.09 (1.05, 1.12) after adjustment for BMI. We did not observe any publication bias for the rs17782313 polymorphism (Begg’s test p = 0.726, Egger’s test p = 0.872; after adjustment for BMI, Begg’s test p = 0.820, Egger’s test p = 0.687). Replication analysis of our observations from a meta-analysis of GWAS consortia showed that rs17782313 polymorphism was associated with type 2 diabetes in both Europeans (OR 1.06, 95% CI 1.01, 1.11, p = 0.022 [Z test]) and in East Asians (OR 1.11, 95% CI 1.05, 1.18, p = 1.95 × 10–4 [Z test]). This association remained significant in East Asians even after adjustment for BMI (OR 1.08, 95% CI = 1.01, 1.14, p = 0.016 [Z test]). However, the analysis of influence of BMI adjustment on association between rs17782313 polymorphism and type 2 diabetes in Europeans could not be performed because BMI data were unavailable for the DIAGRAM Consortium. In the last few years, several GWASs have been carried out for type 2 diabetes and have identified close to 60 loci associated with type 2 diabetes. However, none has reported the SNPs investigated in the present study as strong markers of type 2 diabetes risk. To our knowledge, this is the first meta-analysis investigating the association between polymorphisms near the MC4R gene and type 2 diabetes susceptibility across different ethnic populations. Our meta-analysis, comprising 123,373 individuals from different ethnicities, confirmed that the variant near the MC4R gene was significantly associated with an increased risk of type 2 diabetes and the association remained significant even after adjustment for BMI. This observation is further strengthened by the independent observation from two large GWAS consortia from contrasting ethnicities. Despite differences in the genetic backgrounds of Europeans and East and South Asians, there was no heterogeneity in the overall population and the effect sizes were similar in Europeans and East Asians. The FTO gene was one of the first loci identified for type 2 diabetes risk by GWAS in Europeans. However, after adjustment for BMI, the association with type 2 diabetes completely disappeared . Most recently, a large-scale meta-analysis by Li et al  demonstrated a significant association between a variant of the FTO gene and the risk of type 2 diabetes in East and South Asians. Notably, after adjustment for BMI, the association remained, suggesting that the FTO gene influenced the risk of type 2 diabetes independently of BMI. Similarly, we also observed the significant association between polymorphism near the MC4R gene and type 2 diabetes independent of BMI in European and Asian populations. The mechanism underlying the association of the MC4R polymorphism with type 2 diabetes risk remains unknown. Like the fat-mass- and obesity-associated (FTO) protein, melanocortin 4 receptor (MC4R) protein is produced in abundance in the central nervous system, which regulates energy metabolism . Many studies have indicated that MC4R may influence both food intake and energy expenditure through a distinct pathway . On the other hand, our results are in agreement with the finding that MC4R polymorphism is significantly related to insulin resistance . Further longitudinal studies are necessary to investigate the independent effect of the MC4R gene and its interaction with obesity on risk of type 2 diabetes. In conclusion, our meta-analysis confirmed the BMI-independent significant association of rs17782313 polymorphism near the MC4R gene with risk of type 2 diabetes in the study population comprising Europeans and Asians. These findings are similar to those showing an association of FTO variants with type 2 diabetes risk in Asians . Further studies should be conducted to identify the causal variant and the underlying mechanism of the identified association. We thank the members of the DIAGRAM Consortium for kindly sharing the summary data of their meta-analysis. This study was partially supported by the National ‘Twelfth Five-Year’ Plan for Science & Technology Support Program (2012BAI03B03), the Independent Innovation Foundation of Shandong University (2010GN046), the Foundation for Outstanding Young Scientist in Shandong Province (BS2011YY026), the Council of Scientific and Industrial Research (CSIR), and the Ministry of Science of Technology, Government of India (NWP0032). BX and JM conceived and designed the study. FT, GRC, NK, HWP, HYP and DHZ contributed to acquisition, analysis and interpretation of data. BX and GRC drafted the article. BX, JM, FT, GRC, NK, HWP, HYP and DHZ revised the article critically for important intellectual content. All authors approved the final version to be published.